Hi Everybody!! I hope all of you have a wonderful New Year! This year has been such a fun year for me. . .thank you to all of you who visit my site and the kind comments that you've left me. 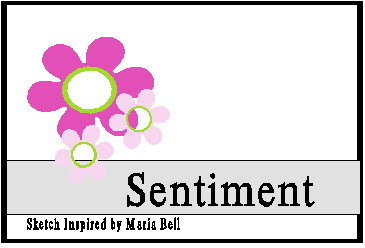 I've met such wonderful people through this blog site and for that, I am very grateful. I am glad that I found people who share my passion and to be able to get to know y'all better! I have plans for the upcoming year that I'm excited about and look forward to sharing them with y'all! I hope you have a new year filled with happiness and many wonderful adventures!! I won't be posting anything until Jan 2. . .I'll be taking a 2 day break to spend with my family. Have a safe New Year celebration and don't get too drunk! For me, my party days are over. . .we're just going to go out to dinner and a movie! Good Morning Folks! Whew. . .I finished this project yesterday. It was a bit painful but it came out okay. I had a few problems altering the tin box. JoAnns had a 70% sale on Christmas items and their Christmas tins were less than a dollar so I bought a WHOLE BUNCH of them. 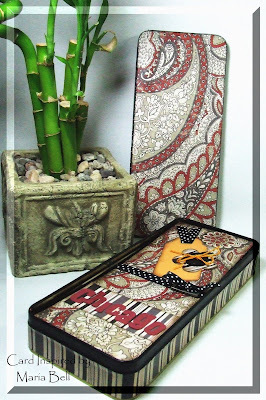 Craft tin boxes are expensive and I have a problem altering a plain silver tin box that cost several dollars. . . some running over $5.00 especially the larger ones. 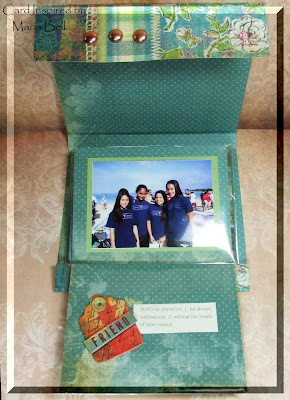 Anyway. . .I altered the tin box with modge-poge and designer paper. After I was done, I accidentally tore the designer paper because it wasn't completely dry so I had to redo it. It was so frustrating. This is the accordion album inside the tin box. I've been looking at different designs of scrapbook albums on 2 Peas and most of the projects are so busy looking so I decided to create a busy album. As a cardmaker, I need to get over the uniformed look of cards and step into a scrapbookers mindset. 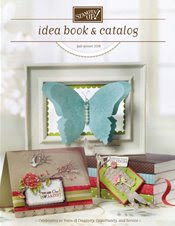 I noticed that scrapbookers use lots of colors, textures, embellishishments. Many projects are very hodge-podge looking. . .you know. . .rarely uniformed or even symetric. I have a lot to learn. This is the album opened up. The pictures are of my kids taking funny pictures of themselves while we were riding the trolley in Chicago. Our trip to Chicago was one of my favorite trips. Chicago is such a fun city. I loved it. I hope one day, I'll be able to visit Chicago again. Hey Everybody! 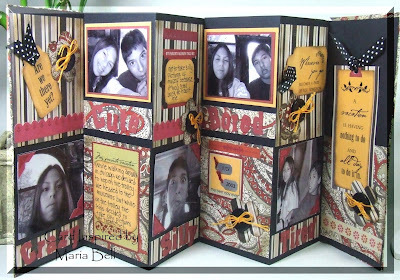 Like I told you on previous posts, I really want do more scrapbooking because I have sooooooo many pictures and they are all hidden away in my computer for no one to see but my self. I was inspired by a layout I saw on the Close to My Heart summer catalog. I just sort of flipped to a page and decided to try it out. It's not exactly like the layout. . .I just took a few ideas and created my own layout. I really would like to learn more about scrapbooking. Right now, I can't come up with my own layout without looking at a book, magazine or blog. My goal is to come up with my own layouts one day. The picture is a photo that my daughter took of herself. I thought it had a artsy look to it so I decided to use the photo. 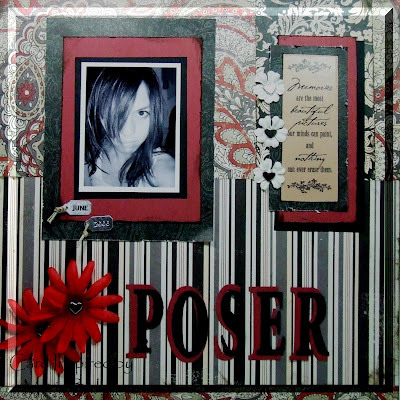 For those of you who don't know what a "poser" is. . .well, it's someone who is trying to act like someone they really are not. It's a teenage lingo that my kids use all the time to say that someone is being a "fake". LOL! Well, when I saw this photo. . .the first thing came to mind was that she was being a "poser". Accessories: I don't know the brand of the big flowers (I threw away the label), JoAnn heart brads, Prima, Inc (small flowers), Verse sticker by Cloud Design (Fiskar), Metal date tags by JoAnn, Alpha Title created on the Craft Robo. Good Morning Everyone! You're like, "girl. . .you've been busy!". Actually, these cards were REALLY fast to make. 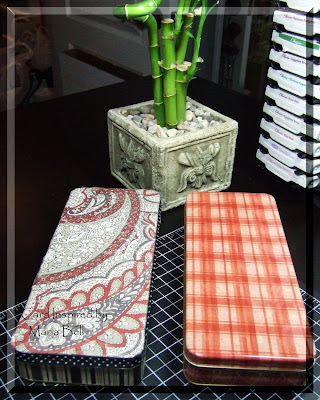 For those of you who rubber stamp, you know that stamping can take a lot of time because you color, emboss, etc. 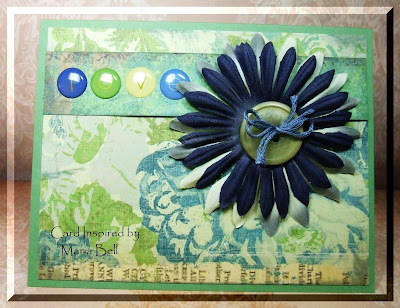 Well, what I love about "scrappy cards". . .meaning cards made with scrapbook embellishments - scrappy cards are fast to make. All you need to do is create a layout of your embellishments and stick'em on. I think all these 4 cards were created about the same time to make one "rubber stamped" card. Hey. . .I was wondering. . .do you prefer the sketches to be big like how it is now or small. Do you think it takes too much time to scroll down because the sketches are too large or do you like it the way they are? If you folks prefer it small then I'll post them at a condensed size. All the cards were created with one double sided designer paper, a few scraps and two cardstock. 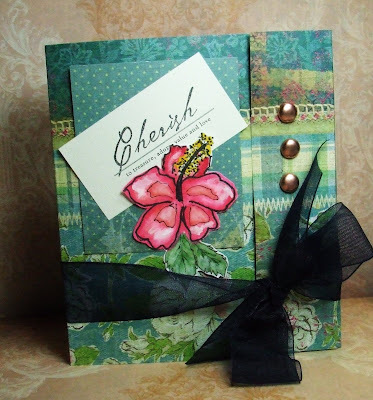 I don't know who makes that big flower on the first card because I threw away the label but the flowers and leaves on this card and the other cards are by Prima, Inc. The center of the flower is a brad by Making Memories and the wavy word is by Basic Grey. 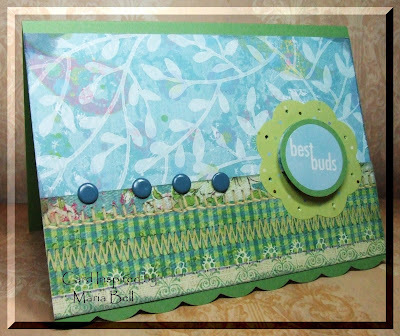 I made this card using scrap designer papers by K&Co and DCWV. The eyelets are by Making Memory and the flower sticker and sentiment is by Ki Memories. I used a Fiskar "cloud" scissors to cut the scallop at the bottom. I rubbed distressing ink by Tim Holtz on the edge of the card. All the materials are the same on this card but the brads are from JoAnns and the circle sticker alphas are by Ki Memories. Next year, my goal is to work on more scrappy cards and scrapbook projects. I've been primarily a rubber stamper but I'd really like to try something new for 2008. 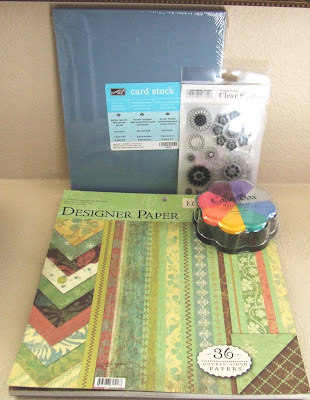 I have a lot of scrapbook embellishments and paper and I really need to start using them so be prepared to see more scrappy projects from me!! Warning: There is music with this video. Please turn down your volume or use the video knob to adjust the volume as needed. It's a nice classical music and it goes well with the video. Click the "pause" button on the video player to read the instructions as you watch the video. Sorry for the poor lighting on the video. Hi Everybody!! How was everyone's Christmas? Hope y'all had a great time! It was a nice Christmas for us. I actually got EVERYTHING I asked for considering I asked for only one thing! LOL! I got the 72 set Copic markers. Yay! But wait. . .my husband not only got me one set. . .he got me ALL of the sets! HOLY COW! That's nuts! I almost fainted when I opened my box. Afterwards, I was like. . .I really didn't need all of the colors but hey, I'm not complaining. 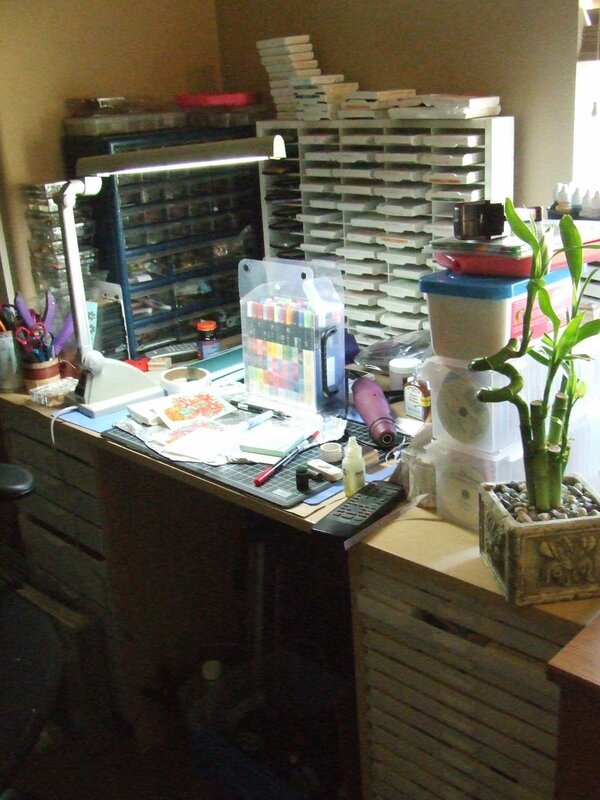 I also got a flat screen TV/DVD player for my craft room, a new craft desk, a digital camcorder and a photo light box. Anyway. . .check out the tutorial. I know the video is a bit dark but I didn't realize it was so dark until after I was done with the tutorial. Keep in mind, the tutorial is speeded up to reduce the time. Who wants to watch a long, long tutorial, right? Again sorry for the poor quality of the video. I'll brighten things up next time. 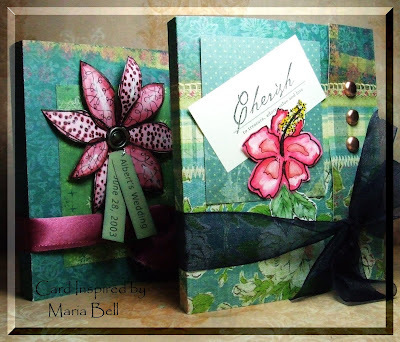 Here are the two completed mini brag book/scrapbook album that are shown on the video tutorial. It's a cute album. . .approximately 5 1/4" x 4 1/2". It's a great album to send to friends and family. Be sure to check out the tutorial and see how simple it is to make it. This is the completed album that is shown on the video tutorial. On the video the album does not show a complete version of the album. This is the first page of the album. This album is a horizontal view. There's a total of 6 double sided pages for a total of 12 pages. I just realized that I created the front cover with a vertical orientation. Oh well. . .that's okay. 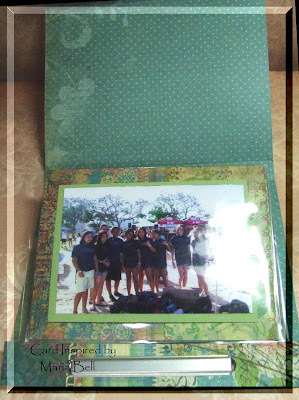 The theme of this album is my daughter and her friends at Ala Moana beach in Hawaii. My daughther was part of a club in school that focused on technology and leadership. They had to design and create a boat using what available materials they had. They then had to race with the canoe in the water. Some canoes sank immediately. This is a picture of my daughter. She was a paddler for the race but she fell off the canoe and they lost the race but the boat was the most sturdiest of all the canoe entries. I created a small journal to this page as you can see. No journaling on this page. . .just a picture of my daughter and her friends. Check out the other mini album I created below. 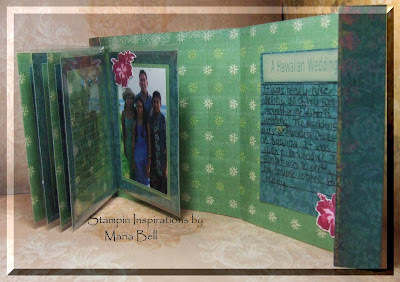 The theme of this album is my cousin's Hawaiian wedding in Hawaii. We all dressed in Hawaiian attire because the wedding was at a Luau. It was so fun because wedding's and funerals, it seems, are the only time that all of my family get together in one place. It was really nice to see everybody. 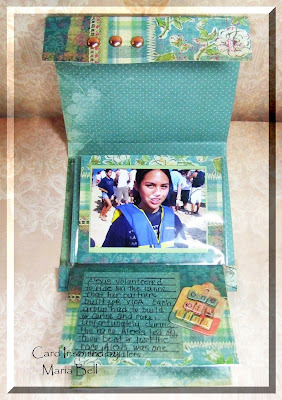 pictures and the journaling. I'm new to scrapbooking so I'm not quite ready to jump into the overly busy, overly embellished albums and layouts. I prefer the simple looking albums right now. Maybe next time I'll do a busy looking album with all the chunky embellishments and such. Try out the tutorial! Let me know if it's hard to follow. I'm thinking of creating a written version of it for those who may have problem following the video. Stay tuned. Whole Lotta Beautiful Christmas RAKs!! Hi Everybody!! I'm back from my blog vacation. 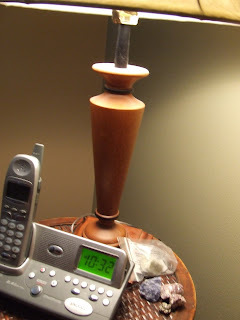 It wasn't much of a vacation because a few days after I posted that I was on a blog vacation, I ended up with the flu. I'm so happy that I now feel soooooooooo much better. Unfortunately, I could not make all the projects I intended to send to friends and family. I feel really bad about it. I feel bad because many will not receive them until after Christmas. I still will make them but well. . it won't be a Christmas gift but more like a New Year's gift. Here are a bunch of Christmas RAKs I received. I can't tell you how happy I am to receive them. While I was sick, they really brightened my day. Everyone is so sweet and I really appreciate that y'all thought of me this Christmas. 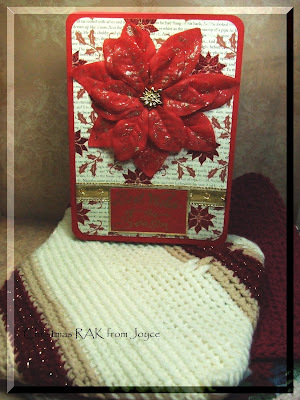 This beautiful card and knitted/crochet hot pad and dishcloths are from my lovely friend Joyce. Her card is so stunning. It's beautiful. Her knitted/crochet art work will be definitely put to good use. Looks like she put in a lot of work into her handmade gifts and I really appreciate her thoughtfulness. Thank you Joyce for sending me the beautiful handmade gifts. . .they really brightened my day! 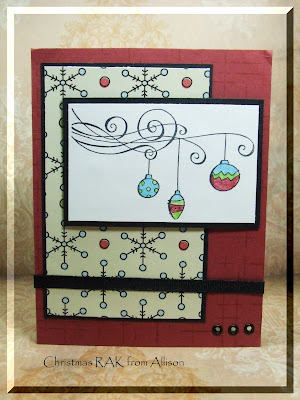 This fabulous card is from Monika of M.A.D. Stamper! 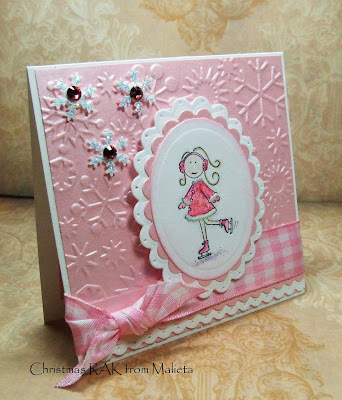 Monika's cards are beautiful on her blog site but in person, wow. . .it's much prettier. You can't see it but the image is glittery. I really love the embossed background. Thank you Monika for thinking of me this Christmas!! I received this lovely card from Angel of Angelosity. Isn't it pretty? I really love the pink and green combo. . . if you haven't noticed that a lot of my cards use this color combo because it's my favorite. I love the circle tag that stands out on Angel's card. Very creative. Thank you Angel for the beautiful card. I also won a prize for her sketch challenge! Whoohoo! I love ric-rac ribbon and buttons. I also will definitely put good use of the stickers and stamps. 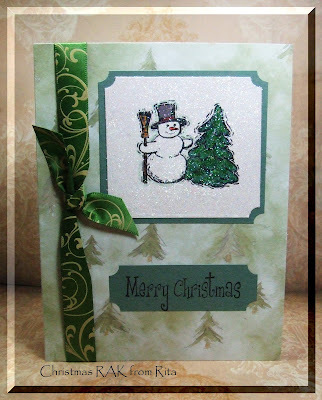 This fabulous shimmery Christmas card is from Rita of Rita's Little Corner. I'm so glad the camera picked up the very shimmery detail of her card. It's really pretty. Can you see it? Thank you Rita. . .I love your beautiful card! 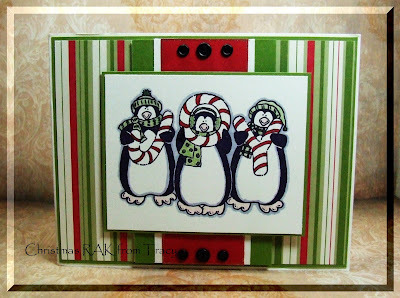 This lovely penguin Christmas card is from Tracy at Tracy's Happy Place. 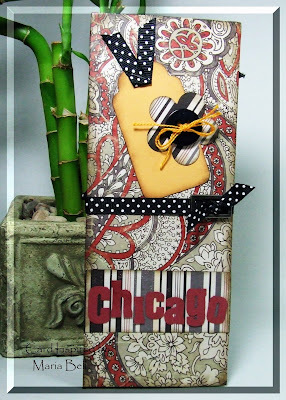 This is one of my favorite images from Stampin Up. Tracy's card is so cute. . .I love it! Thank you Tracy. . .you are too sweet! 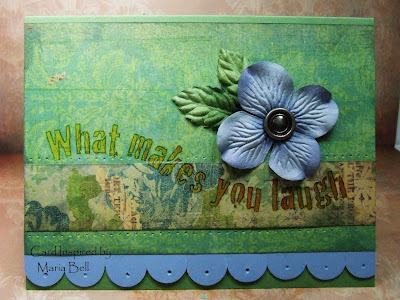 This beautiful shimmery card is from Malieta of Life's Simple Pleasures. In person the card is very shimmery, even the embossed BG paper. It's beautiful. I love the rhinestone snowflakes. Thank you Malieta for thinking of me this Christmas. 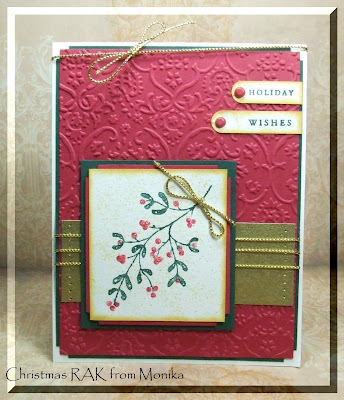 This fabulously festive card is from Allison of Stampin When I Can. I really love the colors of her card and the image is very pretty. Thank you Allison for sending me your lovely creation. It's always a pleasure. This beautiful card is from Janaina at 2 Worlds. It's such a pretty card. . .it's very elegant. Beautiful. Thank you Jana for this beautiful card!! Hi Everyone! The holidays are beginning to get really hectic so I decided to take a longer blog break. I'll be back blogging in about a week or so. I have a lot of catching up to do so I need to take this break. If I can spare some time, I may post something from time to time. Until then, I hope everyone is enjoying the holidays!! Tracy H. of Tracy's Happy Place!!! Good Morning y'all! Let's congratulate Tracy! Whoohoo! She won the blog candy prize. I decided to use Random.org to pick the winner because there were so many entries. I, initially, was going to pull a name out of a bucket but I soon realized that there were too many entries for me to sit and cut up names for every entry submitted. Using Random.org #268 popped up and on the list Tracy H. was #268. It seems Tracy is a very lucky girl. . .looks like she won another blog candy recently. Gosh, I wish I was that lucky! I want to thank every one of you who played along with my blog candy celebration challenges. I had a BLAST reading your entries, looking at your pictures, and learning a little bit more about all of you and your thoughts and opinion. I especially had a lot of fun looking at your "chaotic space"!!! You were all very brave to take a picture of your spaces when it wasn't cleaned up! AWESOME!!! Anyway. . .with all that being said. . .I'll be taking a blog break for a few days because I really need to get caught up on life. I'll be back next week! I hope you all are enjoying the holidays! Again, thank you everyone for making this celebration such a fun one!!!!!!!!!!!! Happy Birthday Blog!!! Yay! Blog Candy Challenge Day 5! Happy Birthday to my blog!!! Today is the last day of my blog candy challenge! 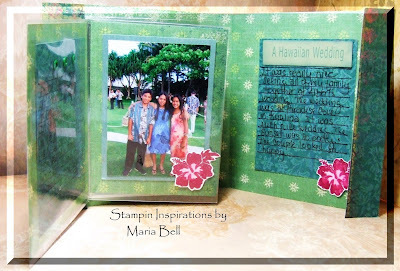 You have until 12:00 midnight to submit any of the 5 challenges I've posted for this blog site and Stampin Inspirations. If you haven't participated in any of the challenges. . .it's your last chance. You have at least 12 opportunities to submit your name. Scroll down for the 5 different challenges for this site and stop by Stampin Inspirations for that sites challenges. "Tell me 3 things that you asked Santa to bring you this Christmas"
I have an interesting story about this request. My husband asked me what I wanted for Christmas this year. . . . I said: "a copic sketch marker 72 piece set C". He looked it up on the Internet and saw the price and said "it's $299.00!!! What crazy person would buy markers for that amount?" He then said: "but you have a lot of markers, what are you going to do with the ones you already have?" I said "nothing, I'm going to keep them and still use them". He said "so why do you need these markers? Explain to me why they are THAT good." Seeeesh, he acted like I asked for a car. So, I explained to him the typical benefits (interchangeable nibs, excellent color results, refillable, airbrushing, etc.) Furthermore, I explained that Copic Markers are actually not "craft or rubber stamping markers". They're markers primarily used for illustration - many use them to draw amine (Japanese Cartoon), magna (Japanese comic books) and other illustrations such as car design or fashion sketches. I told him that I can use them to draw as well and share the markers with the kids. The kids will definitely love to play with them - they love drawing amine characters. If I add the kids to the mix, I know he'll get the markers for me. That's it. . .I didn't ask for anything else for Christmas. Now it's your turn. . .comment on the 3 items that you asked to receive for Christmas. Name your top 3 high ticket items. Don't be modest. . .wish for BIG things and you may receive it! Santa may be nice to you this year!! You have until 12:00 midnight to submit your comment! Good luck on the blog candy everyone! Hi Everyone! Wow, thank you for playing along with my blog challenges. It's been fun to see your responses. Thank you especially to those who sent a picture of their craft space and calming piece. 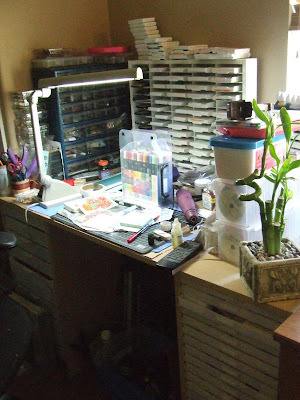 I know it's difficult to show your desk at its present state but hey, it's better to be real. . .a crafter's space HAS to be messy or cluttered; otherwise, you're not busy creating. 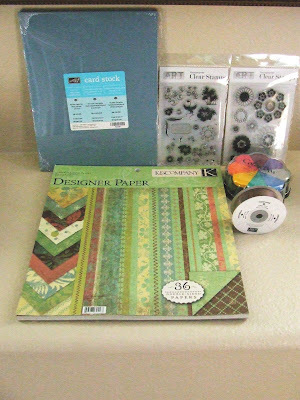 Today's added prize is a stack of K&CO double sided designer paper. I love K&Co. papers because they're almost as thick as cardstock so basically you can use it as a cardbase. Furthermore, the patterns are so pretty. This stack contains 36 double sided designer paper. The cover shows the different patterns of paper. This prize will be added to the prize bucket. "Tell me something that is peculiar, unique or interesting about you"
I do a very peculiar thing. . .I collect "energy" stones and I place them in areas where I hang out regularly. About 8 years ago, I walked into a gift shop in Hawaii that sold greeting cards, incense, stones, and crystals. It's a store called Sedona. Anyway, they sell a wide variety of loose stones of all sorts. The concept is that stones provide a particular energy that you can harvest when you place the stones in areas near you. Well. . .it's not that I'm superstitious or anything like that. I just thought the stones were pretty but my mood is influenced by the aura or energy around me and hey, it can't hurt to have these stones around me. I want positive energy around me all the time so I now collect these stones for that purpose. Check out pictures of my stones below. One more thing. . .I have serious buyer's remorse. I'll put a whole bunch of stuff in my basket when I'm in a store and before I check out, I'll put at least 85% back on the shelf. If I actually do buy something, especially something expensive, I'll have days of anxiety and wonder if I REALLY needed it. Sometimes I'll even return it because it stresses me out so badly. Today's challenge is to tell me something that you feel is peculiar, unique or interesting about you. Comment this post by December 5th 12:00 midnight PST. I can't wait to hear your response. I have these stones sitting on my nightstand next to my bed. One stone calms your mind and helps reduce mental stress, worries, and anxiety; gain personal insight and wisdom, and stimulates intuitive knowledge and clarity. Another stone is a good luck stone, it also enhances perception and sharpens intelligence, clears mental and emotional blocks and promotes good health and wellness. I think I've covered all the basis with these stones. I think that is why I wake up happy everyday. Seriously! I really do. I always get out of bed excited about what the day will bring. Believe it or not but I put these stones in my purse and that's the reason why my purse is so heavy. The white stone represents peace, the brown stone for healing and vitality, and the third stone is for prosperity. I bought these stones during our trip to Colorado. I wear this clunky bracelet. They are made out of stones. There are 3 different types. . .one is for calming, the second is vitality, and the last one is for prosperity. Do they work? I would like to believe they do.. . This is a silicon stone sitting right in front of my computer screen. Silicon amplifies positive feels and reduces feelings of anger; helps clear negative energy, and promotes higher sales if placed near a cash register or cash box. This is a good stone to bring along with you at craft fairs or demonstrator workshops!! LOL! Good Morning folks! Remember you have until December 5th to play all the challenges! 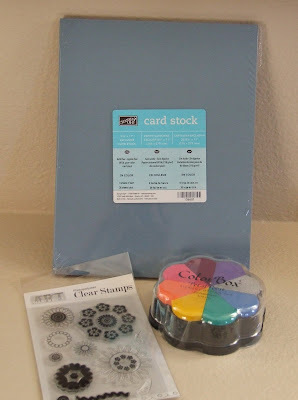 Today's prize addition is Stampin Up's last year "In Colors"! Remember cool Caribbean and cranberry crisp? Yup! Some die-hard Stampin' Up fans will pay double to triple the amount of the cost of these puppies. Why? Because it retired and once it's used up, it's gone forever. 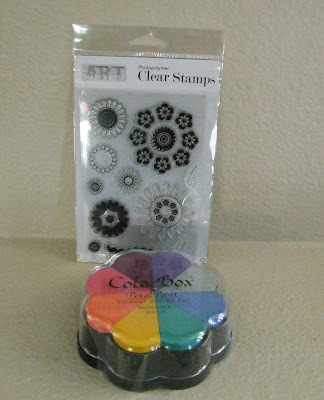 Hopefully, if Stampin Up will be smart about it and retire some of the current colors and add last year's "In Colors". In the meantime, it can be yours. I bought a bunch of packs before they retired and I am willing to part with one of them. It was hard but I thought it would be a great addition to the prize bucket. "What is your pet peeve in regards to reading other people's blog sites?" My pet peeve is small pictures. I don't like small pictures because I don't like to click on the image to make it larger just so I can see what it is. It's just an extra step that I don't have the time to do. I usually move on to the next blog site if the pictures are too small . It can be the most beautiful card you've ever made but if it's small I won't bother looking at it. Sorry! Hi Everyone! I want to clarify a few things about the challenges. All of the challenges are due on December 5th, therefore, if you missed a challenge on the day it was posted, you can still play along. Each challenge counts as one entry so if you play both challenges on each blog site, each time you play, your name is submitted as an entry. There will be a total of 10 challenges combined from both sites so you actually have an opportunity for 10 entries plus 2 for commenting on the Blog Candy Rules post (1 for each site). That means a total 0f 12 entries. As for the prize, I add a prize each day and accumulate them. There is only 1 winner. I will pull gather all the entries from both sites and randomly choose one winner. I will show all the prize that will be given to one lucky winner on December 5th and announce the winner on December 6th. Each day I show a picture of the prize added to the prize bucket. Hope y'all have fun playing. I'm trying to make the challenges easy but I'll add one or two that requires you to make something. Good Morning Folks! Well today is day 2 of my "Blog Candy Challenges" and I added a prize to the prize bucket! I added the Colorbox Petal Point pigment ink pad. 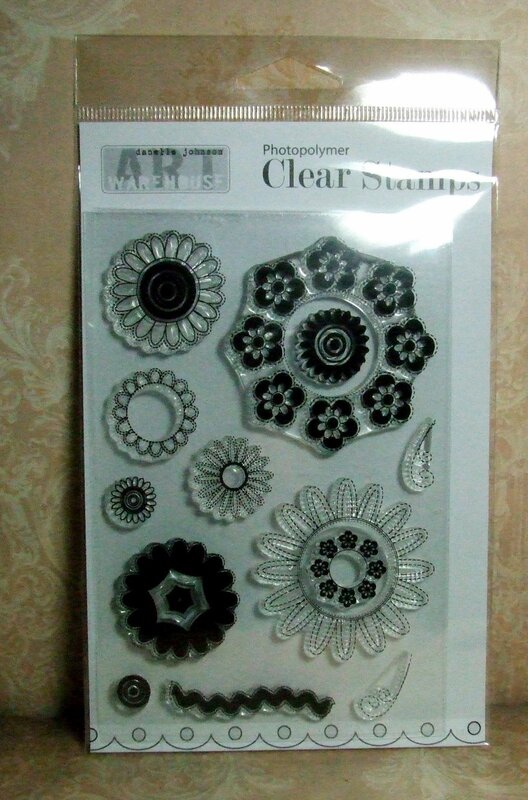 Stampin Up up until this year sold the Colorbox Chalk Petal Point ink pad. I didn't see it in this year's catalog. I love this ink pad because it's very versatile. If I have the time today, I'll add a video tutorial on how versatile the pad is. Be sure to return tomorrow to see Day 3's challenge and added prize. Good luck! If you've been following my Blog Candy, you would know by now that you have multiple opportunities to enter your name for this blog candy. How? 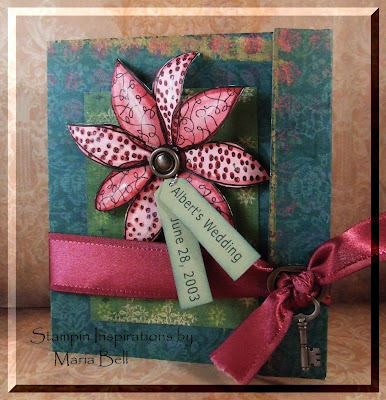 For those who have not had an opportunity to stop by my blog sites in the last few days. . .well, each day I add a challenge on both my blog sites "Card Inspired" and "Stampin Inspirations". You may participate in both site's challenges and have an opportunity to add 2 entries each day until my Blog Candy ends on December 5th! "What technique would you like for me to create on a video tutorial?" If you are a regular visitor to my blog sites, you already know that I've recently started creating video tutorials. I'm not sure what type of techniques people would like to see so this blog candy challenge will help me figure out what tutorials to create. The challenge is to comment this post and let me know what technique you would like to see on a video tutorial? That's it! Simple, huh? You have until December 5th to answer this question. 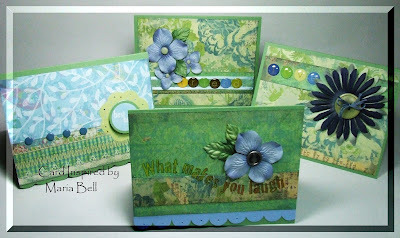 Okay folks. . .why don't you stop by Stampin Inspirations and check out that site's challenge! Good Morning Everyone! I'm sorry that this blog candy challenge is a little late but my Internet server flaked out on me this morning - AGAIN! Saturdays are the worst day to go on the Internet. Anyway, the clear stamps above is the first prize to go into the prize bucket. It's a stamp set by Hampton Arts "Art Warehouse" design. No, it's not the only prize for this blog candy. . .each day I will post a picture of each prize that will be accumulated for the next 5 days and ONE lucky winner will win all of them. It's sort of fun to see what prize you can receive each day if you play along. I got this idea from Angel at "Angelosity" when she was doing a blog candy for her birthday. I thought the idea was so ingenious. Okay. . .now to the challenge! Before I tell you what it is. . .my two blog sites have different challenges, therefore you have two chances each day to add your name to the blog candy bucket! I will be drawing the name of the winner out of this bucket on December 6th. There will only be one winner of the blog candy prize even if you participated on both sites. Participating on both sites just provides you more entries! Don't worry the challenges will be easy so you won't have to work so hard to enter your name. "Peace and Calm In spite of the Chaos"
Send me a picture of your desk at its current state right now whether it's messy or not. If it's messy, actually it's a good thing because that means you're creating! Don't clean up your desk if it's messy. . .why? 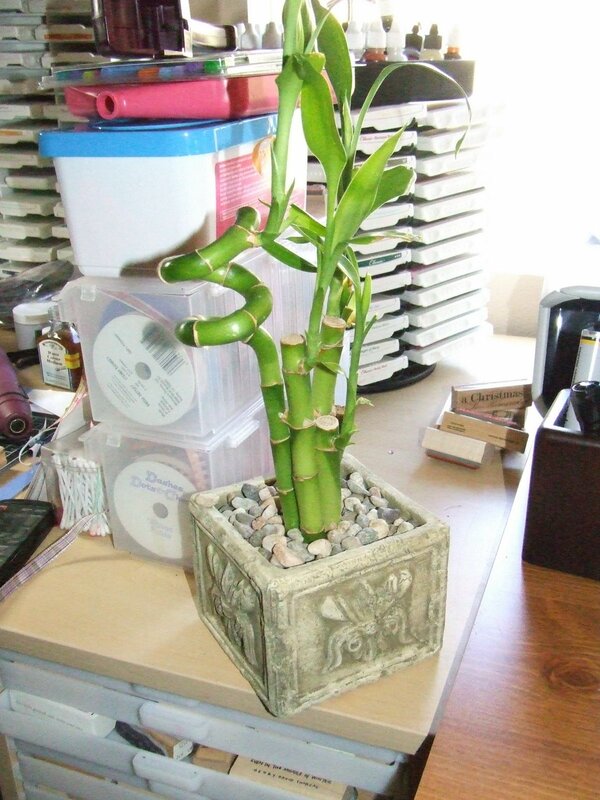 What this challenge is about is to add an item on your desk that provides you a sense of peace and calm. If you already have one. . .GREAT!. . .if not, add something. Like what? Well, it can be anything. . .a picture of your kids, a small potted flower, stones. . . . . .whatever. The concept of "peace and calm" is very subjective so it's up to you on what item you want to add. BUT it can't be a food item like a box of cookies or a craft item. I know for some of us, those items provide peace and calm but it has to be a fixture that you can keep in one place for you to look at on a daily basis and relaxes you when you are feeling stressed or out of control! My calming "zen" piece is a bamboo plant that sits right at the edge of my desk. It's the only thing on my desk when I'm creating that is calming to look at and I like having it there, especially when I'm stressed out! Send me at a picture of your desk at its current state with the "calm and peace" item on your desk. Email the picture to lbmcd66@hotmail.com or post it on your blog and send me a link to your blog site. Let me know what the "peace and calm" item is. Remember it can be anything YOU feel that calms you when you look at it. You have until December 5th to submit your pictures. Okay! Hope you'll play along!